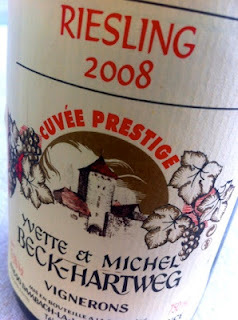 When La Revue du Vin de France was to select French Winemaker of the Year 2011 the choice fell upon in Wettolsheim. Why? Was it because of their legendary Pinot Noirs? The classic Riesling Grands Crus from Schlossberg, Furstentum and Hengst? Or because every wine of the estate, despite its' pedigree, is on the top level in a region where the competition becomes stiffer for every year. 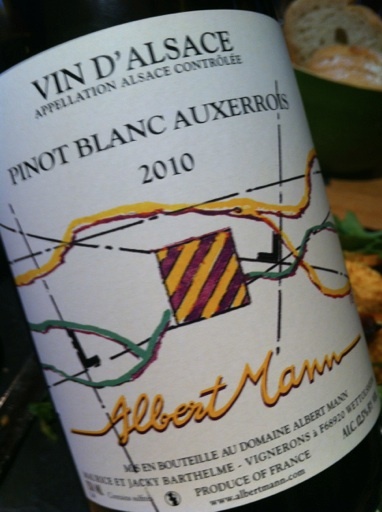 2010 Pinot Blanc Auxerrois from Albert Mann turned out to be the right choice at the cool restaurant Le Coupil i Ribeauvillé, a perfect match for tapas and a tartine with mozzarella, tomato and ruccula. The aroma is a sofisticated bowl of strawberry, melon, pineapple, orange and almonds. The taste has great tension, is fresh and elegant and displays the versatility of the grape in a perfect manner. Not a great wine but really, really good. Price: € 10. In the southern part of the Bas-Rhin the best slopes are granitic. The geology is not as complex as some tens of kilometers south around Ribeauvillé, Riquewihr and the other famous villages in the heart of the Alsace vineyards. The wines from the granites of Bas-Rhin grow in a pretty cool microclimate and are clean, crisp and crunchy with nice acidity. Growers avoid botrytis on the bunches because in order not to risk that the wines lose their elegance. 2008 Riesling Cuvée Prestige from Beck-Hartweg in Dambach-la-Ville has all the classic Riesling components in the fragrance. There are apples, candied lemon and acacia but also a smokiness reminiscent of Chablis. The taste is medium bodied with layers of ripe fruit, while the tartaric acid gives the wine a wonderful structure, and the aftertaste has a slight, mineral saltiness. Extremely well made and inspiring, created by the mere 25-year-old Florian. Price: € 7.